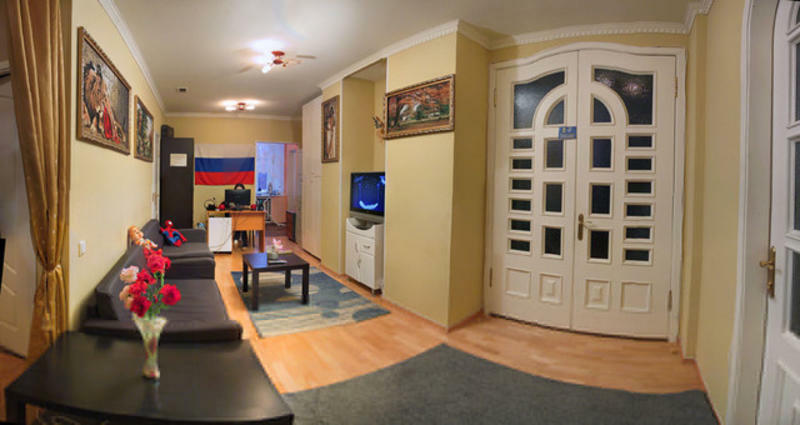 If you want to make your staying in Moscow not only interesting but also comfortable, our 7 Sky Hostel is the right choice. There are more than enough shopping, cultural, historical, entertainment points around us here. This will help you spend a greater time in Moscow. All those guests who come to enjoy Moscow nightlife will spend no time reaching most of the centrally located night clubs. Our hostel is 2 minutes walk from Chistye Prudi/Turgenevskaya metro st., but the neighborhood is really quiet, far from the main traffic. Red Square is within 15 minutes walking distance from here. 7 Sky Hostel has the coziest and very quiet atmosphere inside, at the same time a lot of people can have small parties here whenever they want. We have three shower rooms and three bathrooms, nice chill room and safety lockers. Our kitchen is equipped up to the highest expectations of quests who like cooking. All the guests who have stayed here leave with positive mood and unforgettable impressions also because of a friendly and helpful attitude of our staff. Et Cetera theater.. Across the street from the theater's box-office/entrance walk into the opposite houses court yard. You will see two similar red buildings. Our hostel is in the one on your left. The address is: Miasnitskaya 21/8, building 5, entrance 2-d 2 (plaque by the door), 2-d floor, apartm. 24, door Code 24К4728.